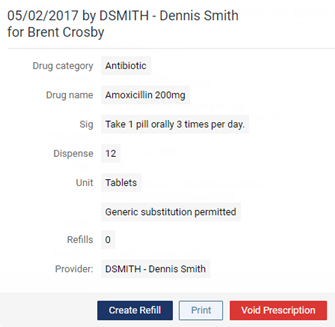 You can view a patient's prescription history at any time. 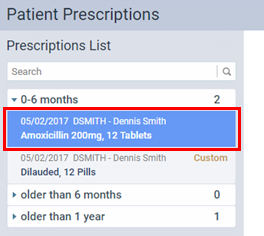 On the Patient menu, under General, click (or tap) Prescriptions. The patient's Patient Prescriptions page opens. In the Search box, begin typing part of a drug name. The matching prescriptions appear in expandable and collapsible sections by time frame (for example, 0-6 months). Continue typing as needed to narrow the search results. 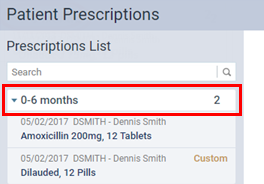 Expand the sections to locate a prescription written in the past six months, six months to a year ago, or longer than a year ago. Note: You can refill or void the prescription.